Laurinda Fabião Ngovene is a resident of Djodjo village at Chokwe Epicentre in Mozambique. She has one daughter and has been invovled with The Hunger Project since 2006. She joined The Hunger Project during her first Vision, Commitment and Action workshop in her community. Laurinda moved into leadership roles in the community, serving as the head of the microcredit bank where she was in charge of distributing loans. She has also taken on the task of being a leader at the Epicentre’s Water and Environmental Sanitation program. She even served as a board member of the Rural Bank in Chokwe. Laurinda says The Hunger Project’s programs have helped her empower her community to become sustainable. She has benefited from the Agriculture Loan Revolving Fund where local farmers access seed and fertilizer loans at the start of the planting season. 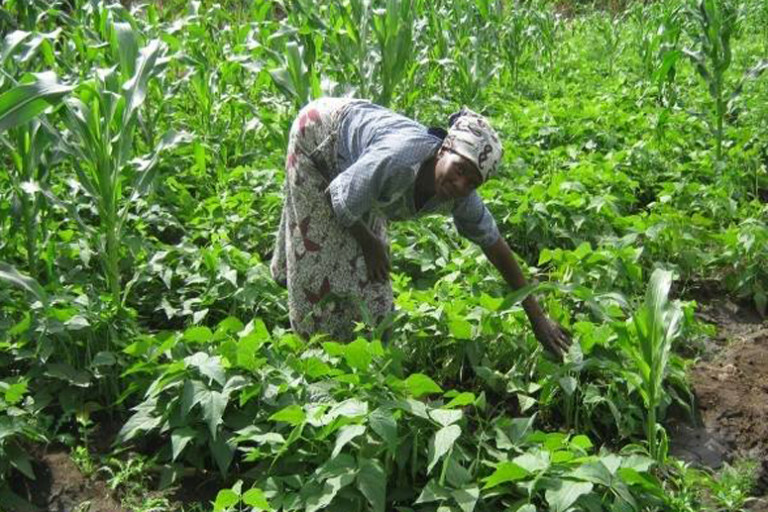 She uses the fund to produce corn, beans and vegetables at the association’s farm. The income from her agricultural activity has made significant improvements in her life. With the first credit she received, she bought a cow. Six years later she now has five cows that she uses for plowing in her business. Laurinda also sees the benefits of the Epicentre’s health center that helps keep farmers healthy and thereby increases productivity. She still recognizes several challenges, such as a lack of transportation methods. As a result, she is striving to help her community acquire bicycles to facilitate carrying out mobilization activities, and a truck to carry products from the farm to market.